Perfected by the great Guru and sage Patanjali in Bharat or the present day India, in ancient times, Yoga is an eternal and precious gift of our country to the people of the universe. Humanity can immensely benefit from Yoga by making it a part of life and living. Though perfected and gifted by the Hindu Gurus, Yoga is not to be equated with Hindu religion, its rituals or practices. Yoga therefore, transcends religion and is a secular affair in its manifestation. People belonging to all races, cultures, religions, countries and other backgrounds can adopt Yoga, without any inhibition. Yoga is a civilization gift from the Hindus to the world that can usher in harmony in life and living. By sacredly addressing the trinity of Kaayaa-Mana-Atmaa, Yoga, when practiced in right earnest and under the supervision of a Guru of standing; it can synchronize the subtle aspects of the three, fusing them into a unified whole. The Yoga postures and Kriyas are panacea of optimum health. It can be highly beneficial in maintaining good health, as well as to cure or prevent diseases of body and mind to a great extent. While practicing Yoga, it is essential that proper and recommended diets (Saatwika) are taken. The benefits of Yoga is best realized in a natural and serene environment, away from the clutter and din of the society. However, the students of Yoga are not required to turn ascetics or remain outside the usual fold of the immediate societal realities and boundaries. 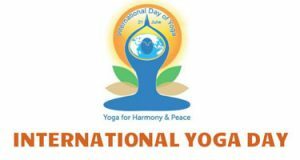 On the occasion of International Yoga Day, today on 21st. June 2018, we the Dental Surgeons, and support staffs at The Dentistree, situated at No.3, Taramani Link Road, Near Hotel Buhari, Dhandeeswaram Nagar, Velachery Chennai, Tamil Nadu 600042, India. Congratulate all the Yoga Gurus and Students of Yoga for their efforts and contributions to make the Day, a success. On our part, we firmly believe that Yoga can help us remain healthy and in harmony with the environment.